YIELD: 120 Board Feet / 10 Cubic Feet (less in cold weather). R-Value 6.0 initial, 5.5 cured. 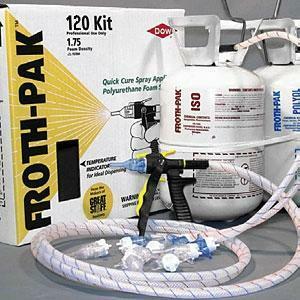 FROTH-PAK 120 kits are typically used for roof foam repair or new installation, insulating sealant to fill cavities, wall and floor penetrations, cold storage facilities and refrigerated trailers. FROTH-PAK is also commonly used to repair spray-applied polyurethane roofs, test cut areas, or damaged insulation boards.